At Holistic Health 2011, Gilliyan will be on stand to promote her highly acclaimed Equine Sports Massage Diploma (ESMT Dip), a five-day intensive course open to qualified Sports Massage Therapists, Physiotherapists, Chiropractors and Osteopaths wanting to learn Equine Sports & Remedial Massage. This course is taught on a one-to-one basis and is followed by in-depth case studies for three/six months & a case study report. It is open to human &/or equine qualified applicants and other qualifications are considered. An overview of DEEP OSCILLATION® is now incorporated within the course. 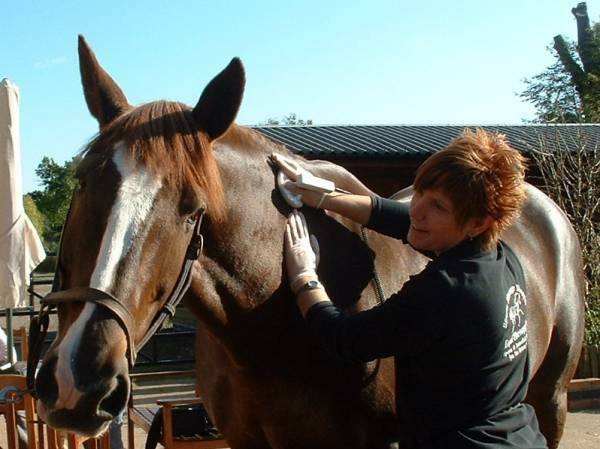 Speaking of DEEP OSCILLATION® on her website Equi-TherapyTM UK Gilliyan reports: "I've used the therapy on everything from bruising to heamatomas, tendon strains to surgery rehabilitation and all results have been remarkable. I have been getting fantastic results with open wounds leaving minimal scarring & white hair growth, which is just fantastic!" NB Holistic Health 2011 is a trade-only event, with free admission for qualified therapists, salon and practice owners, medical practitioners, college buyers and final year students.